We have seen how changes in the money supply lead to changes in the average level of prices of goods and services. How do monetary changes affect other economic variables, such as production, employment, real wages, and”real interest rates? This question has long intrigued economists, including David Hume in the 18th century. Application is tricky when we turn to prices. 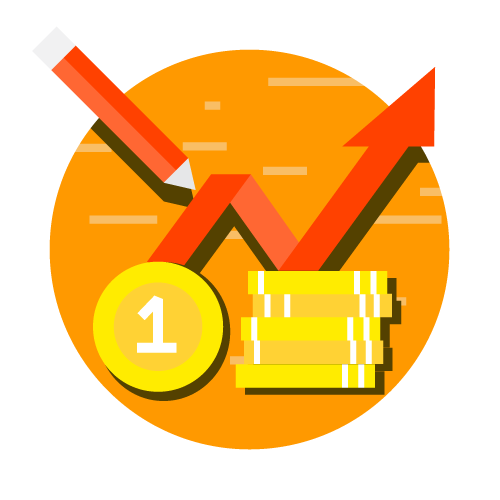 Most prices are quoted in units of money and, therefore, ,are nominal variables. When we say that the price of corn is $2 a bushel or that the price of wheat IS $1 a bushel: both prices are nominal variables. But what about a relative price-the price of one thing compared to another? In our example, we could say that the price of a bushel of com is 2 bushels of wheat. This relative price is not measured in terms of money. When comparing the prices of any two goods, the dollar signs cancel, and the-resulting number is measured in physical units. Thus, while dollar prices are nominal variables, relative prices are real variables. This lesson has many applications. For instance, the real wage (the dollar wage adjusted for inflation) is a real variable. because it measures the rate at which people’ exchange goods and services for a unit of labor. Similarly, the real interest rate (the nominal interest rate adjusted for inflation) is a real variable because it measures the rate at which people-exchange’ goods and services today for goods and services in the future. In many cases, it turns out that the velocity of money is relatively stable. For example, Figure 3 shows nominal GDP, the quantity of money (as measured by M2), and the velocity of money for the u.s. economy since 1960. During the period, the money supply and nominal GDP both increased about 20-fold. By contrast, the velocity of money, although not exactly constant, has not changed dramatically. Thus, for some purposes, the assumption of constant velocity may be a good approximation. 1. 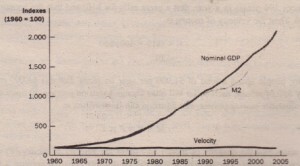 The velocity of money is relatively stable over time. 2. Because velocity is stable, when the central bank changes the quantity of money (M), it causes proportionate changes in the nominal value of output (P X Y). 3. The economy’s output of goods, and services (Y) is primarily determined by factor supplies (labor, I physical capital, human capital, and natural resources) and the available production technology. In particular, because money is neutral, money does not affect output. 4. With output (Y) determined by factor supplies and technology, when the .central bank alters the money supply (M) and induces proportional changes in the nominal value of output (P X y), these changes are reflected in changes in the price level (P). 5. Therefore, when t he central bank increases the money supply rapidly, the result is a high rate of inflation.